My research addresses questions about how anthropogenic change reshapes ecological processes. I am interested in how species interactions, population dynamics, and the timing of biological events respond to various types of environmental changes. My work so far has investigated the consequences of climate change and species invasions for plant-pollinator mutualisms, plant populations, and plant communities. Why is there so much variation in how species adjust their biological timing to a changing climate? What are the demographic consequences of changing environmental conditions (e.g., climate change and pollinator losses)? 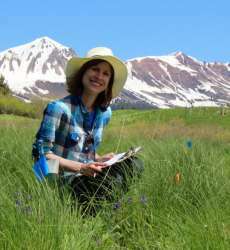 How do species invasions and climate change affect plant-pollinator mutualisms? Iler AM and K Goodell. (2014) Relative floral density of an invasive plant affects pollinator foraging behavior on a native plant. Journal of Pollination Ecology 13: 174-183.